Rhetoric check: the use and misuse of "Atlantic Yards"
Rhetoric matters when discussing the Atlantic Yards project. After all, Forest City Ratner keeps claiming that the project would be built in Downtown Brooklyn. Critics like me have pressed the New York Times on the importance of describing the location more precisely, and the Times recently printed a correction. Another rhetorical tussle concerns the term Atlantic Yards, which entered the public lexicon as Forest City Ratner's name for the 22-acre development project, but also has become attached to the 8.5-acre railyard owned by the Metropolitan Transportation Authority (MTA), the chief undeveloped portion of the site. Thus local officials and reporters, encouraged by the developer, have used terms like "at the Atlantic Yards" or "on the Atlantic Yards," without explaining that it's a proposed development site. These seemingly minor errors serve Forest City Ratner's interest. They falsely conflate the developer's commercial branding--a project called Atlantic Yards--with a much smaller piece of publicly-owned land. The Atlantic Yards area has been available for any developer in America for over 100 years...It represents a whole new possibility of a formerly abandoned area, which is I'm talking about the Atlantic Yards themselves. Markowitz invoked the name Atlantic Yards twice, and both times he was misleading. Atlantic Yards is the name of a project, not an existing entity, as the Metropolitan Transportation Authority (MTA) calls the railyard in question the Vanderbilt Yard. And the Atlantic Yards area could not have been available for any developer, since the project would include city streets, homes, businesses, industrial buildings, and vacant lots--many of which have been well-used in the last century. Atlantic Yards did not exist until Forest City Ratner proposed it at a press conference on 12/10/03. The MTA's Vanderbilt Yard name was so obscure--in a Lexis-Nexis search, I couldn't find a single reference before the Ratner plan was announced--that the invented term Atlantic Yards was quickly used by the press even when referring solely to the railyard. For example, the Daily News reported, in a 3/11/04 article quoting Borough President Marty Markowitz and headlined He's down with plan: The downtown Brooklyn plan... makes no mention of the arena and housing/office tower development proposed by developer Bruce Ratner at Atlantic Yards. 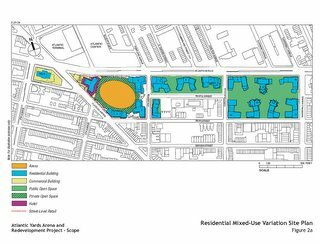 If the term Vanderbilt Yard doesn't trip off the tongue, perhaps the more neutral term Atlantic railyards--used by Park Slope Neighbors, a group critical of the project, better distinguishes the railyards from the larger development site. The name "Atlantic" is understandable, as Atlantic Avenue forms the northern border of the project, but it also might offer some useful associations. Many Brooklynites may remember the empty land cleared to develop those malls, not the structures that preceded them. However, Pacific Street is much narrower, and the name "Pacific Yards" might remind people that the project would encroach on a residential and business district. Indeed, part of Pacific Street would be demapped; this would create a controversial superblock and also allow the developer to claim a lower density than without the street. The "Atlantic" strategy presents some risk: the Atlantic Center mall has been derided as "the ugliest building in Brooklyn," by architectural critic Francis Morrone in the New York Sun (ABROAD IN NEW YORK, 2/23/04), and the Atlantic Terminal mall has gotten mixed, but sometimes harsh reviews. That's why Forest City Ratner has hired much more impressive talent--architect Frank Gehry and landscape designer Laurie Olin--for the Atlantic Yards project. Yards vs. Yard: echoes of Baltimore? Why did the developer choose the name Atlantic Yards rather than Atlantic Yard? Perhaps the plural sounds more organic, as if growing and spreading, rather than a static entity guarded by a fence. Also, "Atlantic Yards" contains echoes of "Camden Yards," the highly-successful 85-acre parcel in downtown Baltimore that houses Oriole Park, a baseball stadium aimed to evoke early 20th-century structures like Brooklyn's Ebbets Field and Boston's Fenway Park. It should be noted, however, that Camden Yards is not exactly part of a low-rise neighborhood. The term Atlantic Yards has regularly been used as if it were an existing entity. As noted, a 1/2/06 New York Times article, headlined "A Mayor With Lofty Goals, and Better Than Average Odds of Reaching Them," incorrectly stated: the fruits of his huge rezoning initiatives along the Brooklyn waterfront and at the Atlantic Yards will not all be realized within four years. The Times hasn't yet printed a correction. A New York Post story (FOUR MORE DEMS NOW LIKE MIKE, 10/17/05) stated: "He shares my lifelong dream to restore Brooklyn as the center of major-league sports," Markowitz said of the mayor's plan to build a new arena for the NBA Nets at the Atlantic Yards. A New York Times Metro Briefing (Developer Promises Benefits, 6/28/05) stated: The developer planning a project at the Atlantic Yards said yesterday that he would give local residents priority for jobs and would provide low- and middle-income housing for them. Even critics of the project, who may not have followed the rhetoric closely, have made the same error--a sign of how the Atlantic Yards meme has penetrated the discourse. Even the NBA commissioner, David Stern, sounds giddy at the prospect of RatnerWorld, a development that will forever alter the skyline of Brooklyn, like a little chunk of Manhattan going up over Atlantic Yards. The Fifth Avenue Committee is one of the plaintiffs in a lawsuit to stop Bruce Ratner from demolishing six buildings en route to building the Nets stadium and hundreds of commercial and residential units over Atlantic Yards in downtown Brooklyn. 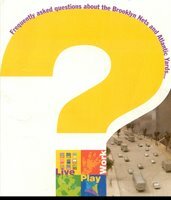 Even the 2004 charrette aimed at an alternative plan for the railyard--though not the surrounding streets--used the name Atlantic Yards Development Workshop. 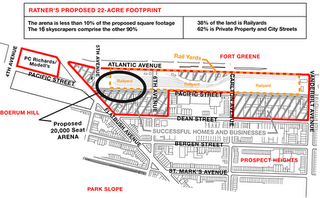 While the document refers to "the Atlantic Yards site," it also calls the railyard Atlantic Yards. While the MTA’s Atlantic Yards need to be developed, the surrounding community is anything but blighted. A letter to the Times's City Weekly both misdescribed the site and appeared under a headline that misstated the scope of the dispute, The headline misleadingly suggested that the dispute is limited to the railyards (Brooklyn's Railyards: The Fight Continues, 12/25/05). The letter said: It is indeed "a matter of scale" here in Brooklyn. Bruce Ratner is gambling that there is a bottomless market for 3,000 market-rate condos in the Atlantic Yards. This article also ignored the much-larger portion of the Atlantic Yards project beyond the arena. The New York Sun has used the terms Atlantic Yards area or Atlantic Yards section, as in the 7/12/05 Legislation in Congress Could Bar Forest City Ratner From Subsidies: Momentum is gathering in both the House and the Senate behind bills that could bar a development firm, Forest City Ratner, from receiving federal subsidies for its proposed high-rise hub in the Atlantic Yards area in downtown Brooklyn. The September 2005 Independent Budget Office Fiscal Brief, Atlantic Yards: A Net Fiscal Benefit for the City?, refers to "the proposed redevelopment of Brooklyn’s Atlantic Yards area" and "the area called Atlantic Yards in Brooklyn," without acknowledging that the name is a commercial moniker. In Brooklyn, developer Bruce Ratner wants to build a Frank Gehry-designed arena for the Nets over the Atlantic Yards rail depot. Mr. Liff said his firm is stunned that other companies are not vying for the rights to build on the Atlantic Yards. Such errors recur in the press and public discourse. 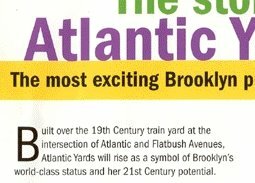 Good branding plus sloppy journalism can lead to the assumption that Atlantic Yards already exists. But it's still important to distinguish the MTA's Vanderbilt Yard--or, more colloquially, the Atlantic railyards--from Forest City Ratner's proposed Atlantic Yards.